It's Wednesday my friends . . . you know what that means . . . we need to check out what'cha been workin' on! First up this week is a stunning dresser restyled by Lee. I think this piece is just gorgeous! 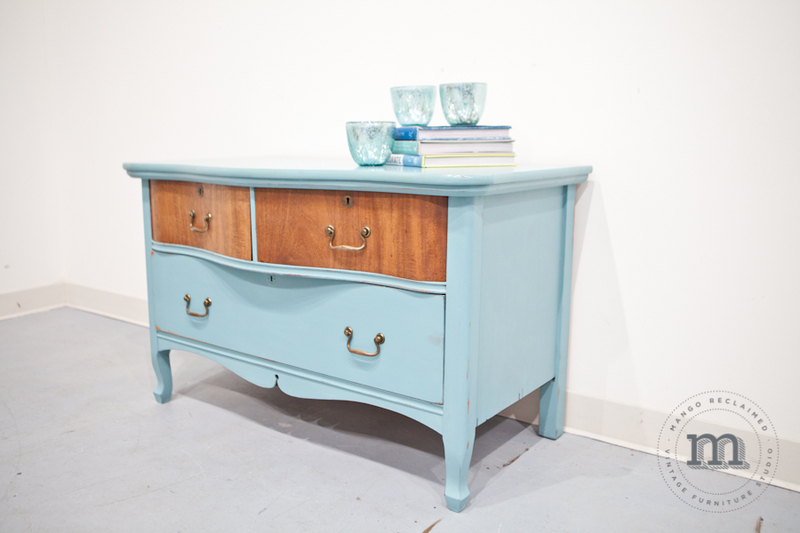 Lee used Miss Mustard Seed's Milk paint in 'Artissimo' blue to make the framework of this dresser really stand out. Heres a nice side angle showing how this piece has been nicely distressed around the edges . . . Thank you so much for sharing Lee - you did an awesome job - as usual! This dresser reminds me of one that we restyled here at the studio a while ago. A customer brought this cute dresser in and wanted to paint it out and leave some natural wood as well. We chose a pretty blue called 'River Tides' from the van Gogh paint line for the framework. For the drawers we sanded off the existing finish and applied hemp oil to nourish the wood and bring out the grain. . . I can't say enough about hemp oil - I absolutely love it, lol! Heres a funky little project for you! Check out this creative side table made by Cathy! How cute are these vintage suitcases all painted out and stacked? Super fun Cathy - thank you for sharing! How was your long weekend?!? Did you get any painting done, lol?? This table was painted with van Gogh furniture paint in 'River Tides', a beautiful soft blue that now adds a nice hit of colour to the hallway. Debbie was so excited to start this project that she almost forgot to snap a 'before' picture. Don't worry Debbie - this happens to me all the time, lol! I just get so anxious to start a project that I completely forget to pick up my camera before jumping in! Ok, whose kidding who, I use my phone for 95% of the pictures I take . . . when did that happen? When did our phones replace our cameras? I would be so lost without my phone . . . . I love the colour you chose Debbie! It's always fun to introduce a bit of colour on a smaller piece - thanks so much for sharing! Next up this week is a unique little antique cabinet restyled by Sue. Using van Gogh's 'Zeppelin' - a grey that really looks great on everything! I like that Sue kept the top a natural wood finish - even I believe that you don't have to paint everything, lol! Love the new hardware you chose from our studio as well Sue! Here's a look at the cabinet 'before'. It was an interesting little cabinet with loads of charm, but a little rough around the edges . . . nothing some paint and TLC cant fix! Great job Sue! Thank you for sharing! Speaking of Zeppelin grey and natural wood tops . 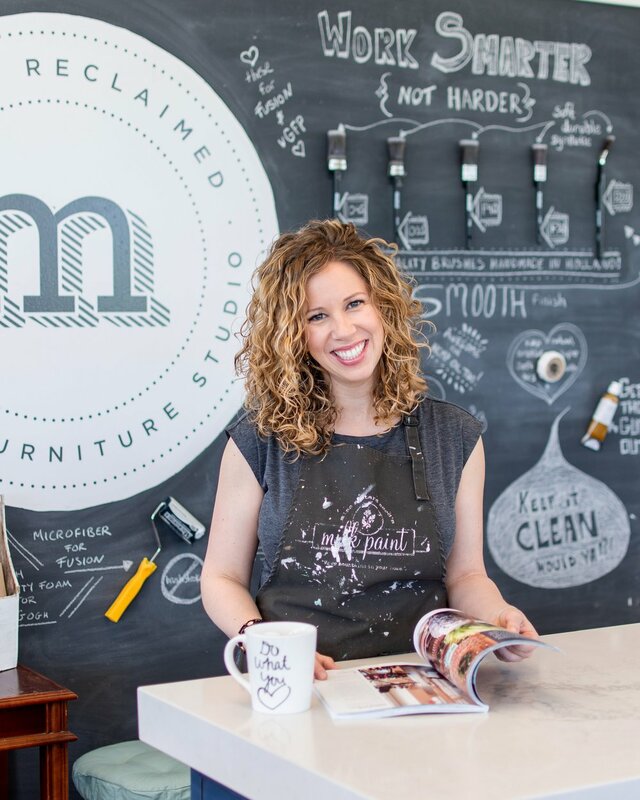 . . check out these adorable end tables restyled by Elizabeth! Just fantastic! Thanks for sharing Elizabeth! Keep up the great work!